We care deeply about delivering the best transportation experience; this means the best experience for the passenger and the best experience for the driver. We believe this quality of service can only be achieved with a deep understanding of our world, our cities, our streets… how they evolve, how they breathe. We embrace the powerful positive impact autonomous transportation will bring to our everyday lives and with our ambition, we will become a leader in the development and operation of such vehicles. Thanks to our network, with hundreds of millions of rides every year, we have the means to make autonomy a safe reality. As a member of Level5, you will have the opportunity to develop and deploy tomorrow’s hardware & software solutions and thereby revolutionize transportation. Lyft’s autonomous vehicle architecture consists of a complex network of embedded microcontrollers, which are responsible for communicating directly with custom electronics. 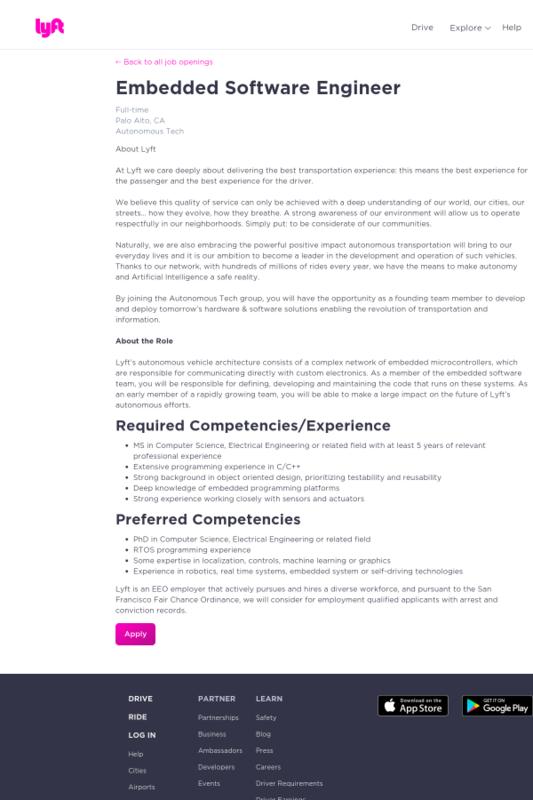 As an early member of a rapidly growing team, you will be able to make a large impact on the future of Lyft’s autonomous efforts.